There are so many different ways to making shrimp that I could have a whole blog and YouTube channel dedicated to just that. However, of all the different ways of having shrimp I love having them either A La Criolla aka Creole Style or al ajillo aka Garlic Style. These are the two traditional Hispanic ways of having shrimp. Although there are many other way of having shrimp, these two styles are anchors in the Hispanic Caribbean community. 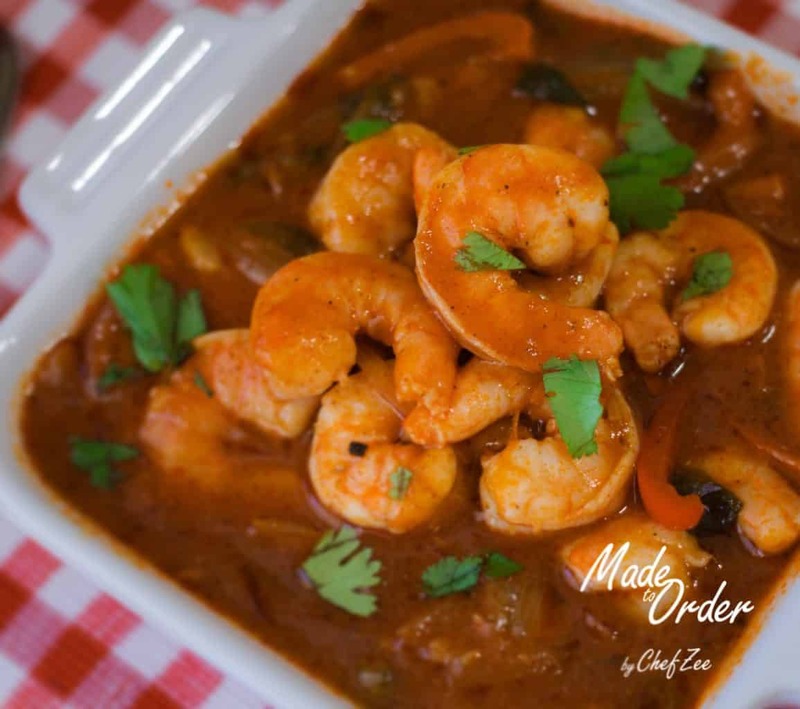 A La Criolla means Creole Style but this is not to be confused with the Creole Style that’s just as delicious and popular in New Orleans. Their roots are very very similar but time and distance has allowed the Caribbean Creole food to evolve separately from the Creole in NOLA. Nonetheless, they both inherently a mix of cultures and spices. Whenever you go to a Hispanic restaurant and see that something is prepared “A La Criolla” this means that it’s going to be cooked in a delicious red tomato sauce with onions and peppers which may or may not be slightly spicy. Whether or not it will be spicy will depend entirely on region. Oftentimes, a la Criolla will not be spicy, but that doesn’t mean you can’t add it yourself! Camarones Enchilados a la Criolla is a light shrimp stew that doesn’t take long to make. You can make it a variety of ways, and I personally love it when it has a strong seafood taste. I do this by making my own shrimp stock which is also very easy to make and take ten minutes. In order to make your own shrimp stock, simply boil your shrimp shells with 2-3 cups of water for 10 minutes. Once the water begins to boil, lower the flame so that the water then reduces to a simmer. My recipe for Camarones Enchilados a la Criolla calls for ½ water and ½ shrimp stock but you can use all water if you’re not a fan of strong seafood flavor or you can use all shrimp stock. The choice is entirely up to you! Alas, shrimp is easy to make but it’s also very easy to overcook so I urge to pay attention to cook time and heat setting while making this dish. Lucky enough, cooking shrimp is also really easy to cook just by eyeballing. As soon as your shrimp goes from a grayish color to an orange color, you can lower the flame or turn off entirely and the shrimp will continue to cook the rest of the way through. Creating a shrimp stock can leave your house pretty smelly. I recommend boiling some water with cinnamon sticks & some vinegar to neutralize the shellfish fishy smells in your kitchen. Boiling water and white vinegar will also do the trick.